The Sixth National Jazz and Blues Festival. 29th, 30th ,31st July 1966. 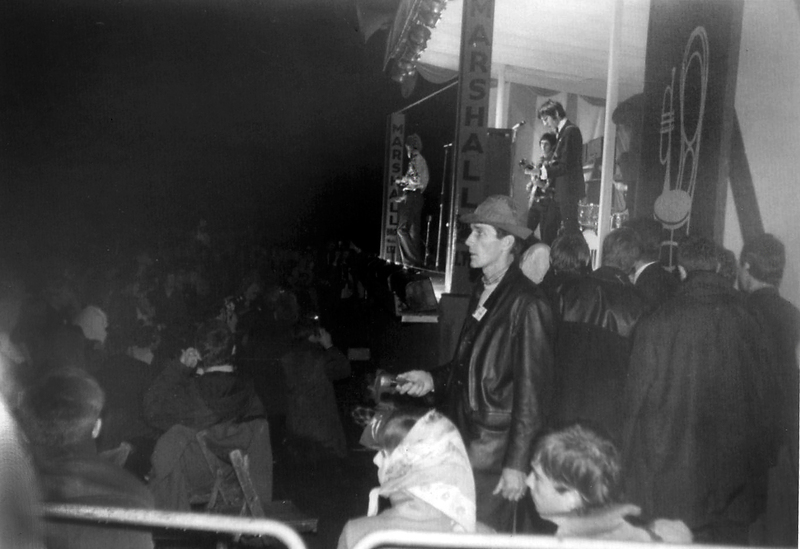 The 1966 Festival was notable for featuring the first major performance by Cream and for the fact that it was the first year at the wonderfully named Balloon Meadow site at Windsor. 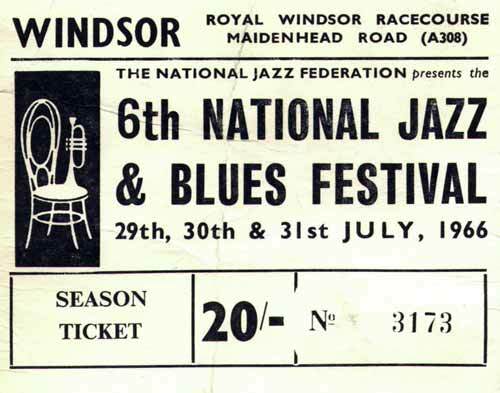 The National Jazz and Blues Festivals of the middle to late sixties were important musical events because they showcased the best of the British rock, jazz and pop bands of the time. Many bands got their big breaks at these festivals, if you performed well, receiving audience acclaim could lead to residencies at the prestigious Marquee club . Some artists even got recording contracts out of their appearances . As you can see from the flyer on the right, the jazz sessions had been relegated to the afternoon and cost half the price of the rock sessions . 1966 featured some good US jazz artists , but no one of huge stature. Its interesting that the festival never aspired to coaxing such jazz greats as Miles Davis or John Coltrane to play at the event . By 1966 the opportunity had probably passed as the UK jazz boom had died to a great extent. However the following year, the Montreux Jazz festival began a successful 40+ year run . Its a shame that nothing similar was ever attempted in the UK. Possibly the inclusion of bigger names may have allowed the National Jazz festival to feature at least one jazz evening session , but it was not to be . 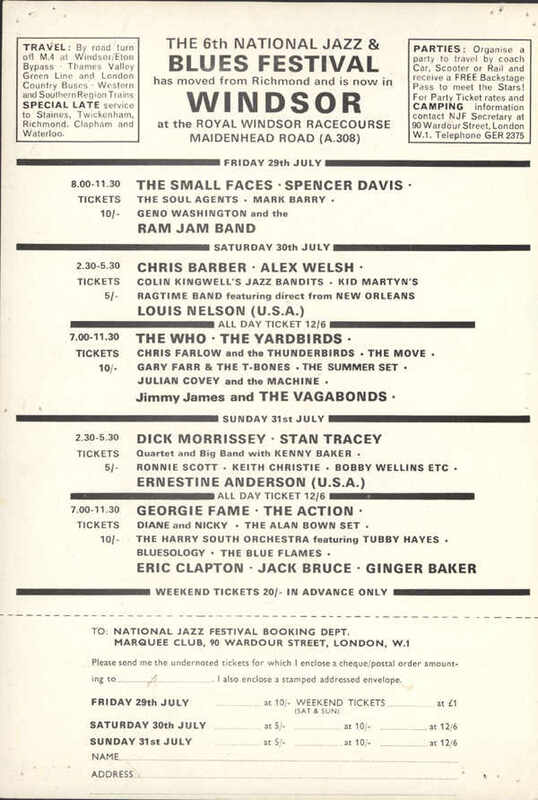 The National Jazz and Blues Fests were often used as debuts for upcoming acts and the 1966 festival was notable as being the first major Uk debut of Cream, the band having only played one other warm -up show beforehand , in Manchester on the 29th. Unfortunately, it rained like hell during their set and the festival turned into something of a mud bath, but it did not stop Cream being greeted rapturously. 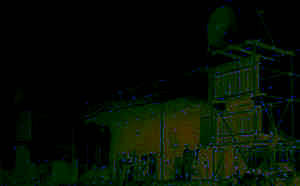 Fortunately it was the last night so the rain did not put too much of a damper on the proceedings. 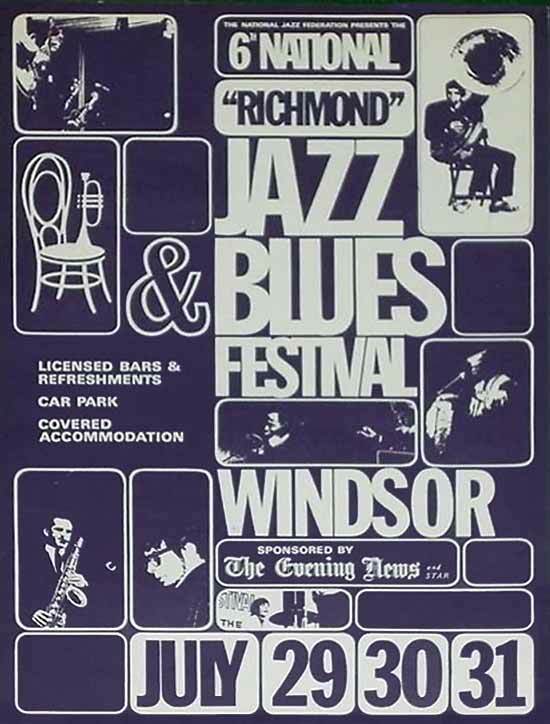 I was also at Windsor in 1966 (we were told it was Cream's first show, but it seems it wasn't - your speculative play list is about right, but I don't remember "Lawdy Momma" until much later and I don't think Toad was in, but then it's 35 years ago now) it was only a short set with the sainted Gee announcing "there are no more numbers" at the end of it. I think I remember Pentangle playing (Bert Janch was almost completely out of it and still playing) but you have them down for 1967, so I wouldn't claim to be certain. Yes, it did pee down on the Sunday night at the '66 when Cream were about to play. I remember walking down toward the stage following Eric Clapton who was being escorted by a gorgeous blonde carrying a multicoloured golf umbrella. As it was raining , a lot of people didn't come out of hiding for quite a while, so we had very little competition for viewing sites. It was certainly a very memorable set and ,although I saw Cream many times after that , this one was special! I remember the Cream set very clearly. I was there with my boyfriend who was a Clapton 'freak' & we sat in the pouring rain (with his black PVC mac over our heads) but it didn't matter! If 'Toad' is the number with the long drum solo then they definitely played it. When Ginger Baker finally stopped after about 20 minutes the crowd yelled for more! I also remember getting the coach back to Windsor & Eton station & on the train home sitting opposite 2 girls - one said to the other 'that Eric Clapton's quite good, isn't he', which made us fall about laughing - what an understatement! The only other band there who made a lasting impression on me were the Alan Bown Set. It was my first festival (at the age of 15) and I'm still a festival-goer at the ripe old age of ** (you can work it out!). I was there and saw the Cream set - 3 songs as I recall and they did no more despite the cheering because that's all they knew or had rehearsed or some such. It was nonsense because they'd played a longer club set somewhere up north just before this. NB : Underlined entries have more details if you follow the link..
GEORGIE FAME AND THE BLUE FLAMES-July 31st. Photos of the Who Jimmy James and an unknown band. You can find out the complete line ups of the first festivals if you follow the links below. Most of these have fairly complete documentation .